Can it be October already? Hard to believe I am not posting a tomato (or beet) recipe. 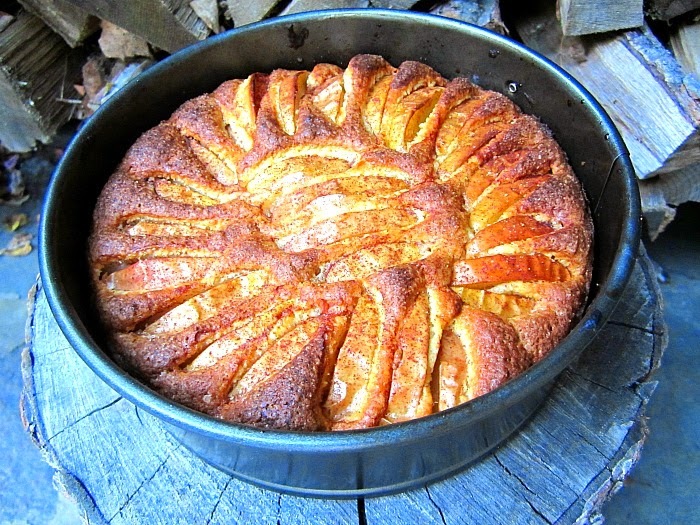 I love this simple apple cake, nothing fancy, I don't even peel the apples anymore. I use local, Oldwick, NJ apples. Gala, Golden Delicious, Cortland or Granny Smith for my cakes and pies. *side note: I know everyone loves those Honeycrisp apples (not me...too sweet), however, they are NOT good for baking, just remember that when your cake doesn't turn out right. 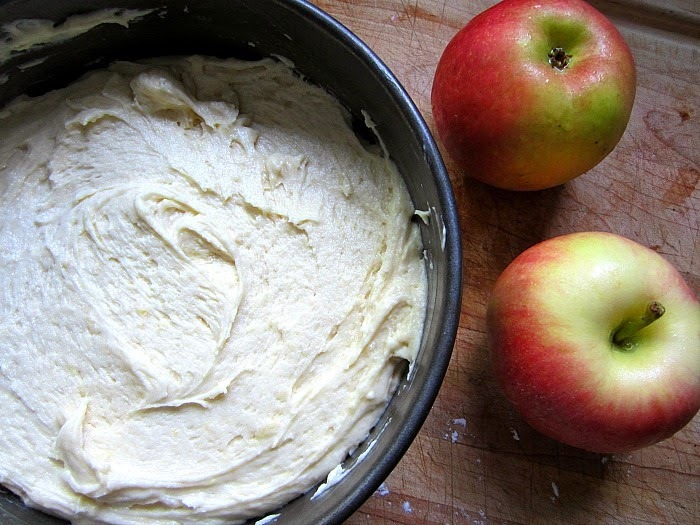 All you need here are 2 apples and I know you have the rest of the ingredients in the house. Make this cake. 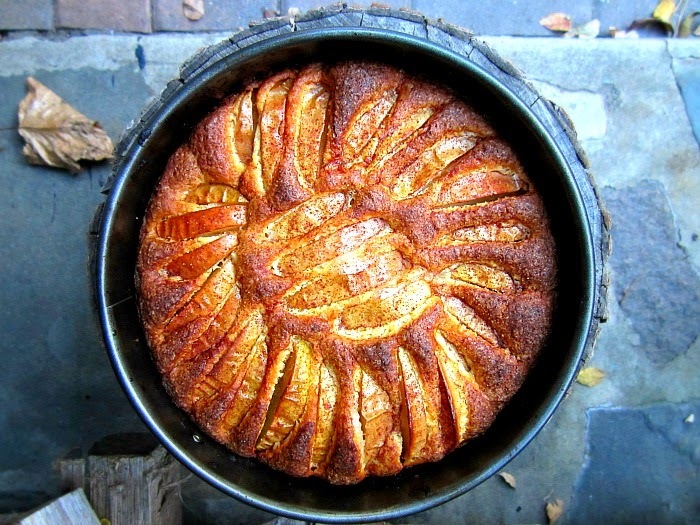 It's the only apple cake recipe you will ever need. Best eaten warm, about an hour after baking. Butter a 9" springform pan. In a large bowl, cream the butter, sugar, zest, egg and vanilla until light and creamy. Mix the dry ingredients in another bowl and slowly incorporate them into the wet batter. Add in the milk and mix another minute. Spread this batter into your buttered cake tin. Arrange the apple slices however you like, I do mine in a concentric pattern. Sprinkle the top with sugar (I used cinnamon-sugar this time). Bake 45-50 minutes, depending on your oven. Let cool 10 minutes and then unmold from the pan. 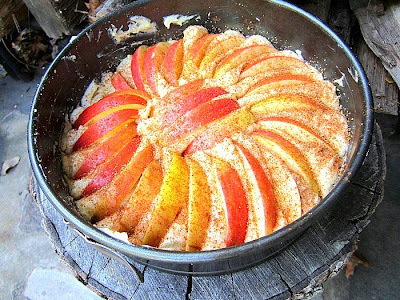 Serve with whipped cream or naked. Yum! I love the Canal House cookbooks. I want to stalk their "workshop" and plead for leftovers. WOWEE!!! My kind of cake.... looks scrumptious (is that how you spell that? )Now if you lived in our neck of the woods, we would have a piece. Oh, that cake looks so good. I'm favoring Ginger Gold apples at the moment. Did you have leftovers for breakfast this morning? Yes, simple is best. 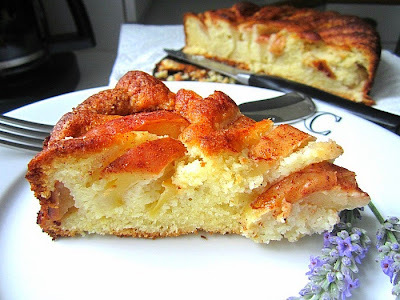 Seems to me this cake would work with thickish slices of end of season peaches as well. We are still getting 4# boxes at Trader Joe's. And the skins are so thin, I'd probably skip peeling. I made this on Friday. I didn't have the lemon zest but I loved it and more importantly, my guy did too. He's crazy about apples. The only recommendation that I would make is to put parchment on the bottom to make it easier to remove the cake. We also made Ina Garten's minestrone for dinner with this for dessert. Very yummy! This cake looks good. I was just at a blogger conference where the girls from Canal House Cooking were the guest speakers and made a delicious dinner...they were great! It's all about the lemon zest and apples here, and for the first time in a long time, I did not need any parchment paper. I buttered the pan really well and had no problem w/ the springform. It's my new favorite. Glad your guy liked it too.